Here is an interesting resource we want to bring to your attention. Compound Interest is a blog by Andy Brunning, a chemistry teacher in the UK. Andy creates and shares a wide variety of educational posters and graphics on everything related to chemistry and chemical reactions. We spent sometime browsing Andy’s collection of graphics and we found them really worth mentioning here. Andy’s graphics are licensed under Creative Commons License, free for educational uses. You can find more about this site's copyright guidelines from this page. Also, the graphics are available in high quality PDF format which you can download and use with your students in class. Andy’s graphics have been featured in several popular media sites including:The Guardian, Huffington Post, Forbes, Business Insider and many more. 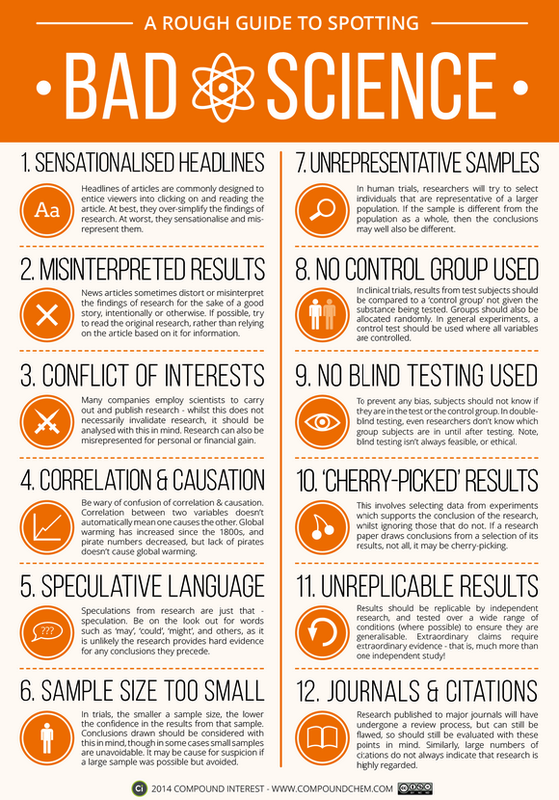 Here is an example of one of Andy's posters on how to spot bad science. We learned about this poster together with Compound Interest from Educational Technology Guy.